Since 1981, Advanced Urology Associates has been providing expert care and treatment for the Bourbonnais, IL, area. Our team is happy to be your number one resource for help with prostate cancer symptoms and treatment options. The prostate is a male-only gland, and prostate cancer is one of the most common types of cancer for men in the United States. This type of cancer grows slowly over many years, and oftentimes symptoms do not appear until later stages of cancer. 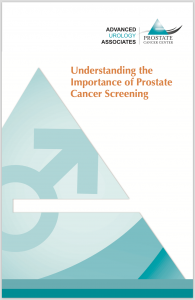 Prostate cancer symptoms include impotence, bloody urine, back and hip pain, leg numbness, or loss of bladder control. These issues are not exclusive to prostate cancer, but if you experience any listed symptom, see your doctor as soon as possible. The sooner cancer is caught, the better it can be treated. How Can Advanced Urology Associates Help? The experts at Advanced Urology Associates provide a free prostate cancer screening, to help detect cancer in its early stages. We then offer state-of-the-art advanced prostate cancer treatment options to all those in the Bourbonnais, IL, area. Request an appointment or give our friendly team a call today at 815.409.4930 to find out more information or to schedule a visit for you or a family member. We will be happy to help.